The domain within your query sequence starts at position 40 and ends at position 86; the E-value for the C1 domain shown below is 4.22e-9. Some bind phorbol esters and diacylglycerol. Some bind RasGTP. 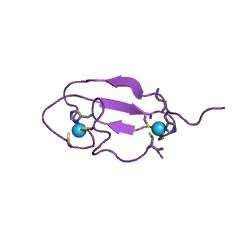 Zinc-binding domains. Diacylglycerol (DAG) is an important second messenger. Phorbol esters (PE) are analogues of DAG and potent tumour promoters that cause a variety of physiological changes when administered to both cells and tissues. 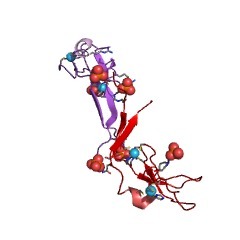 DAG activates a family of serine/threonine protein kinases, collectively known as protein kinase C (PKC) [(PUBMED:1396661)]. Phorbol esters can directly stimulate PKC. 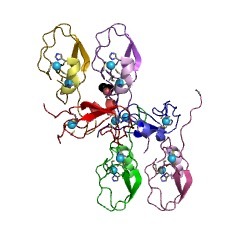 The N-terminal region of PKC, known as C1, has been shown [(PUBMED:2500657)] to bind PE and DAG in a phospholipid and zinc-dependent fashion. 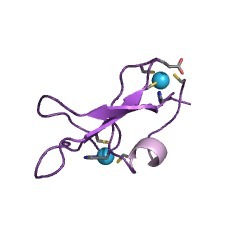 The C1 region contains one or two copies (depending on the isozyme of PKC) of a cysteine-rich domain, which is about 50 amino-acid residues long, and which is essential for DAG/PE-binding. 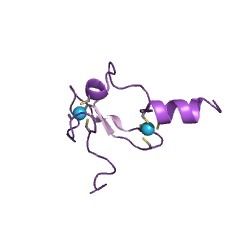 The DAG/PE-binding domain binds two zinc ions; the ligands of these metal ions are probably the six cysteines and two histidines that are conserved in this domain. 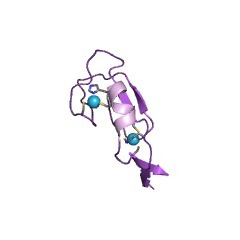 There are 58922 C1 domains in 42393 proteins in SMART's nrdb database. Taxonomic distribution of proteins containing C1 domain. This tree includes only several representative species. The complete taxonomic breakdown of all proteins with C1 domain is also avaliable. Click on the protein counts, or double click on taxonomic names to display all proteins containing C1 domain in the selected taxonomic class. 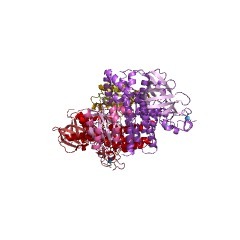 Taxonomy and function of C1 protein kinase C homology domains. 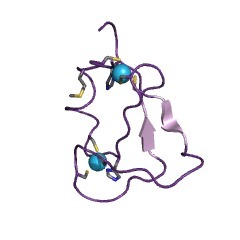 C1 domains are compact alpha/beta structural units of about 50 amino acids which tightly bind two zinc ions. 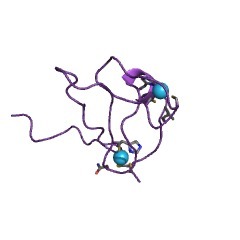 These domains were first discovered as the loci of phorbol ester and diacylglycerol binding to conventional protein kinase C isozymes, which contain 2 C1 domains (C1A and C1B) in their N-terminal regulatory regions. 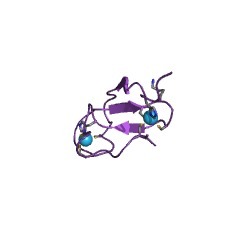 We present a comprehensive list of 54 C1 domains occurring singly or doubly in 34 different proteins. 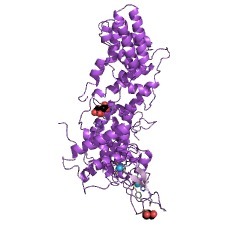 Many C1 domains and C1 domain-containing proteins bind phorbol esters, but many others do not. By combining analysis of 54 C1 domain sequences with information from previously reported solution and crystal structure determinations and site-directed mutagenesis, profiles are derived and used to classify C1 domains. 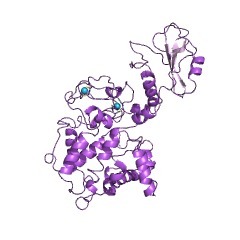 Twenty-six C1 domains fit the profile for phorbol-ester binding and are termed "typical." Twenty-eight other domains fit the profile for the overall C1 domain fold but do not fit the profile for phorbol ester binding, and are termed "atypical." Proteins containing typical C1 domains are predicted to be regulated by diacylglycerol, whereas those containing only atypical domains are not. 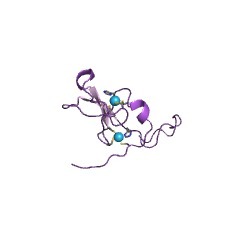 NMR structure of a protein kinase C-gamma phorbol-binding domain and study of protein-lipid micelle interactions. 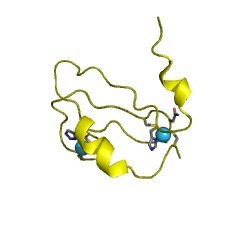 Classical protein kinase C (PKC) family members are activated by the binding of various ligands to one of several cysteine-rich domains of the enzyme. 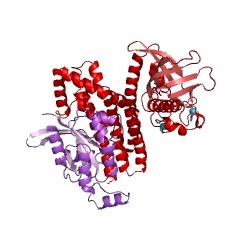 The natural agonist, diacylglycerol (DAG), and the natural product superagonist, phorbol dibutyrate (PDB), activate the enzyme to produce wide-ranging physiological effects. The second cysteine-rich (Cys2) domain of rat brain PKC-gamma was expressed and labeled with 15N and 13C, and the solution structure was determined to high resolution using multidimensional heteronuclear NMR methods. 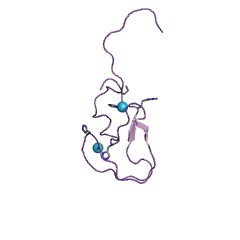 The phorbol binding site was identified by titrating this domain with phorbol-12,13-dibutyrate (PDB) in the presence of organic cosolvents. Titrations of this domain with lipid micelles, in the absence and presence of phorbols, indicate selective broadening of some resonances. The observed behavior indicates conformational exchange between bound and free states upon protein-micelle interaction. The data also suggest that half of the domain, including the phorbol site and one of the zinc sites, is capable of inserting into membranes. Cloning and expression patterns of two members of a novel protein-kinase-C-related kinase family. The cDNA clones for two members of a novel protein kinase family were isolated and sequenced. 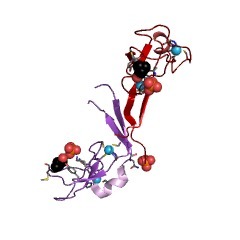 These protein-kinase-C-related kinases, PRK1 and PRK2, display extensive identity to each other, revealing non-kinase domain similar regions. HR1 and HR2. 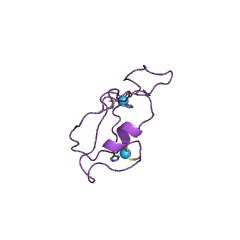 HR1 contains a motif repeated three times (HR1a-c), while HR2 shows similarity to the amino-terminal sequence of protein-kinase-C epsilon and eta isotypes. Both PRK1 and PRK2, expressed in COS 1 cells, are autophosphorylated in immunoprecipitates, indicating intrinsic kinase activity. PRK1 and PRK2, as well as a third member of this family, PRK3, show distinct patterns of expression in adult tissues. 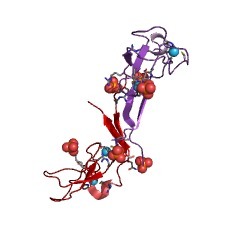 Solution structure of a cysteine rich domain of rat protein kinase C.
Intracellular protein phosphorylation by protein kinase C (PKC) plays a major role in the translation of extracellular signals into cellular events. 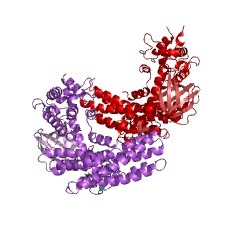 Speculations on the structural basis for PKC activation are based on sequence homology between their cysteine-rich domains (CRD) and the DNA-binding 'zinc-fingers'. We produced a fragment comprising the second CRD (CRD2) of rat PKC-alpha and determined its three-dimensional structure in solution by NMR spectroscopy. 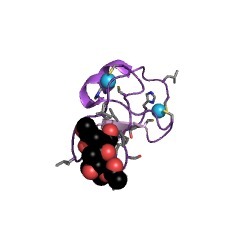 This revealed that CRD2 adopts a globular fold allowing two non-consecutive sets of zinc-binding residues to form two separate metal-binding sites. The fold is different to those previously proposed and allows insight into the molecular topology of a family of homologous proteins. 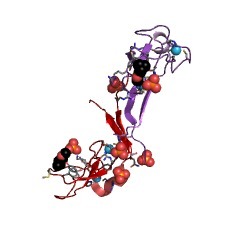 Novel human brain cDNA encoding a 34,000 Mr protein n-chimaerin, related to both the regulatory domain of protein kinase C and BCR, the product of the breakpoint cluster region gene. 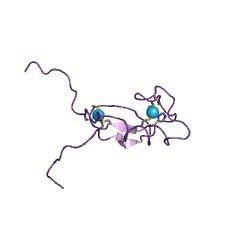 A novel human brain complementary DNA sequence encodes n-chimaerin, a 34,000 Mr protein. 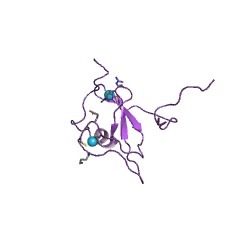 A single cysteine-rich sequence CX2CX13CX2CX7CX7C in the N-terminal half of n-chimaerin shares almost 50% identity with corresponding sequences in the C1 regulatory domain of protein kinase C. The C-terminal half of n-chimaerin has 42% identity with the C-terminal region (amino acid residues 1050 to 1225) of BCR, the product of the breakpoint cluster region gene involved in Philadelphia (Ph') chromosome translocation. 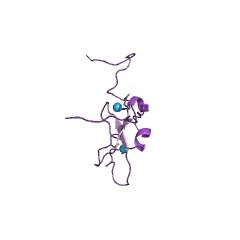 n-Chimaerin mRNA (2.2 x 10(3) base-pairs) is specifically expressed in the brain, with the highest amounts being in the hippocampus and cerebral cortex. The mRNA has a neuronal distribution and is expressed in neuroblastoma cells, but not in C6 glioma or primary astrocyte cultures. 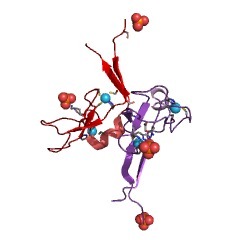 The similarity of two separate regions of n-chimaerin to domains of protein kinase C and BCR has intriguing implications with respect to its evolutionary origins, its function in the brain and potential phorbol-ester-binding properties. 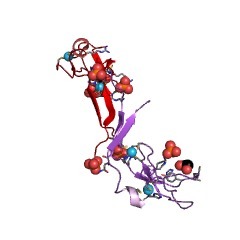 Phorbol ester binding to protein kinase C requires a cysteine-rich zinc-finger-like sequence. 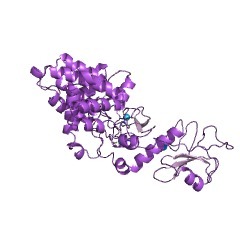 Protein kinase C normally has a tandem repeat of a characteristic cysteine-rich sequence in C1, the conserved region of the regulatory domain. 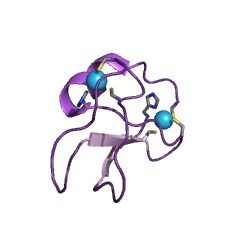 These sequences resemble the DNA-binding zinc finger domain. 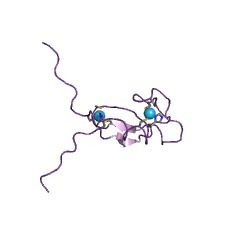 For the gamma subspecies of rat brain protein kinase C, various deletion and point mutants in this domain were constructed, and the mutated proteins were expressed in Escherichia coli by using the T7 expression system. 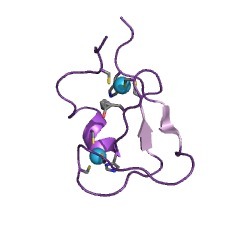 Radioactive phorbol 12,13-dibutyrate binding analysis indicated that a cysteine-rich zinc-finger-like sequence was essential for protein kinase C to bind phorbol ester and that one of two sequences was sufficient for the phorbol ester binding. Conserved region C2, another region in the regulatory domain, was apparently needed for the enzyme to require Ca2+ for phorbol ester binding activity. 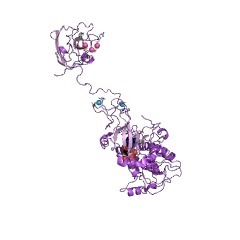 SwissProt sequences and OMIM curated human diseases associated with missense mutations within the C1 domain. This information is based on mapping of SMART genomic protein database to KEGG orthologous groups. Percentage points are related to the number of proteins with C1 domain which could be assigned to a KEGG orthologous group, and not all proteins containing C1 domain. Please note that proteins can be included in multiple pathways, ie. the numbers above will not always add up to 100%.